For anyone to do their job properly, they’ll need the right equipment. Imagine a carpenter having to use a steak knife as a saw, or a hunter using a catapult instead of a rifle. The same goes for the medic. The successful survival caregiver has spent a lot of time and energy (and some money) on accumulating a stockpile of medical supplies. The more the better, since you don’t know how long you might have to function without access to modern medical care. It’s important to note that the value of many medical supplies depends largely on the knowledge and skill that the user has obtained through study and practice. A blood pressure cuff isn’t very useful to someone who doesn’t know how to take a blood pressure. Concentrate first on obtaining items that you can use effectively, and then purchase more advanced equipment as you learn more skills. Don’t forget that many items can be improvised; a bandanna can serve as a sling, an ironing board as a stretcher, or thin fishing line and a sewing needle as suturing equipment. A careful inspection of your own home would probably turn up lots of items that can be adapted to medical use. Look with a creative eye and you’ll be surprised at the medical issues you are already equipped to deal with. 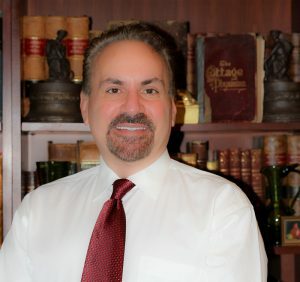 If you are going to be the medical caregiver for your family or community in times of trouble, you will, hopefully, have accumulated a significant number of medical supplies. 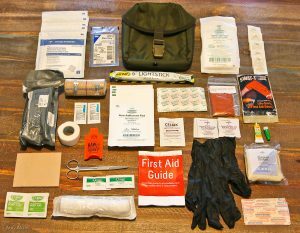 You’ll find many articles that tell you what to put in a medical kit, but few ever talk about a basic piece of medical equipment that everyone needs: the medical bag that will contain all these supplies. Without a place to put your medical supplies, they will, most likely, be strewn about in a way that prevents you from accessing the stuff you need when an emergency arises. This wastes precious time when someone’s life may hang in the balance. Organization is key; if you’re disorganized, you’re not going to be effective at the time you’re most needed. Are you staying in place or on the move? How long will you be the medical resource for your family or group? Are you in an area that is potentially dangerous? What climate should you be prepared for? What medical issues will you be most likely to encounter? Can you depend on clean water? How many medical supplies do you have? Larger bags are made more versatile if they are M.O.L.L.E. compatible. M.O.L.L.E. is a military acronym; it stands for Modular Lightweight Load-carrying Equipment. These bags have what look like horizontal straps sown on the outside of a pack which allow additional items to be secured by attaching them to the loops that are created by the stitching or webbing. Which medical supplies should every member of your family carry in case you get separated? What are the more advanced supplies that the medic should carry? You might start by having members of your group carry an IFAK (Individual First Aid Kit) whenever they’re away from base camp. The family medic carries the advanced items in a larger bag. 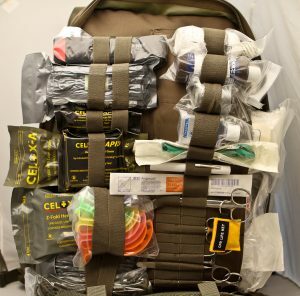 The best medic bags, in my opinion, have lots of clear or mesh pockets. These have everything you’ll need in an emergency in plain sight if packed right, and will avoid the question you never want to ask yourself if someone’s injured: “Where’d I put the tourniquet?”, or “Where’d I put the burn dressings?” Closed pouches in the bag could be used for non-emergency items, like certain medicines, water filters, etc. Putting your items in groups based on the issues they deal with is also a great idea. Choose a backpack with a padded back panel and adjustable padded shoulder straps. Chest straps will also help stabilize the pack. Always distribute weight evenly in your pack. Load heaviest items closest to your back; balance materials so that you can easily stand up straight. For large packs, a hip belt is important. It provides balanced support and takes strain off sensitive neck and shoulder muscles. Whether the bag is short or tall, has an internal frame or is soft are important factors to determine comfort and utility. The key is to have the medical kit make sense for you. 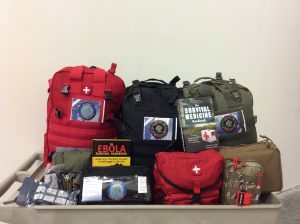 Many medical kits, like you can find at our website, come already packed with supplies. This might mean deconstructing it and moving things around so that the arrangement seems natural for your purposes. A medical bag doesn’t have to be commercially produced; if you’re staying in place, a tool box or other item that sets up your supplies in an organized way is all that is needed. Choosing the right bag for the right job is as important as having the right medical items. Do a little research to see what your options are; you’ll be glad you did. 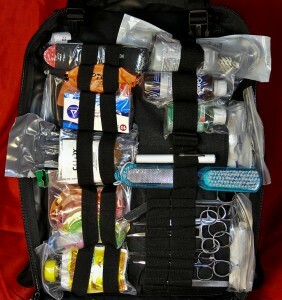 See a wide selection of bags, packed kits, and individual supplies at Nurse Amy’s shop at store.doomandbloom.net.